This summer, a small group of Kansas City residents will have the chance to vote to establish the funding mechanism for a southern streetcar expansion line to UMKC. Applications to vote in the mail-in election are due next week. A highly-anticipated election will soon be underway in Kansas City, Missouri, but you might not know about it — and most Kansas City residents won't get to vote in it. In fact, the immediate future of the UMKC streetcar extension is in the hands of about 30,000 registered voters who live in the area roughly between the Missouri River and 53rd street, and State Line Road and Campbell. In order to vote, you have to live within the boundaries of a special district. The boundaries of a proposed transportation development district, or TDD, are one of the main funding mechanisms for a streetcar extension to UMKC. A map of the proposed taxing district is available here. A mail-in election to establish that district begins on June 20. But the deadline to apply for a ballot is May 23. Why restrict the election to voters in a small area? Because these residents would be on the hook for special property assessments to generate funding for the streetcar and the additional sales tax would only be within that district. "So the larger community is not directly contributing in any meaningful way financially to the extension, so those people who are allowed to participate in the voting process," says David Johnson, chairman of the Kansas City Regional Transit Alliance. Mail-in elections are not uncommon for establishing special taxing districts. They're less expensive than a traditional in-person election, for one, and they allow for more flexibility in terms of timing. But they're also a little more complicated. Voting in this election is a multi-step process over several months. For this election, people living within the proposed streetcar extension TDD must first apply for a ballot and provide proof of voter registration. Applications are available here. Again, the deadline for getting those applications turned in is 5 p.m. on Tuesday, May 23. On June 20, ballots will be mailed to qualified voters who got their application in on time. The ballot then has to be notarized before turning it in no later than August 1st. It may seem a long, drawn out process — and it is. But this is only the first of three elections that would happen before any actual work on designing and engineering the streetcar begins. If voters approve the establishment of the district in this election, another election — this one in-person — will be held to appoint a board of the district. After that, a third election would be held for voters to approve the imposition of the sales tax and property assessment. That puts us at late 2017, early 2018. Even if the process gets that far, taxes would not be collected until the rest of the financing for the project is secured. Doug Stone, an attorney for the petitioners looking to establish the district, says the TDD would only provide about half of the total funding for the extension. "Assuming everything goes according to schedule, you wouldn't have that extension line running until 2022," Stone says. If you don't qualify to vote in this election, you can still vote on streetcar-related issues in August. Although this series of elections is only open to voters within the proposed TDD district, there will also be two streetcar-related questions on the city-wide ballot in August. 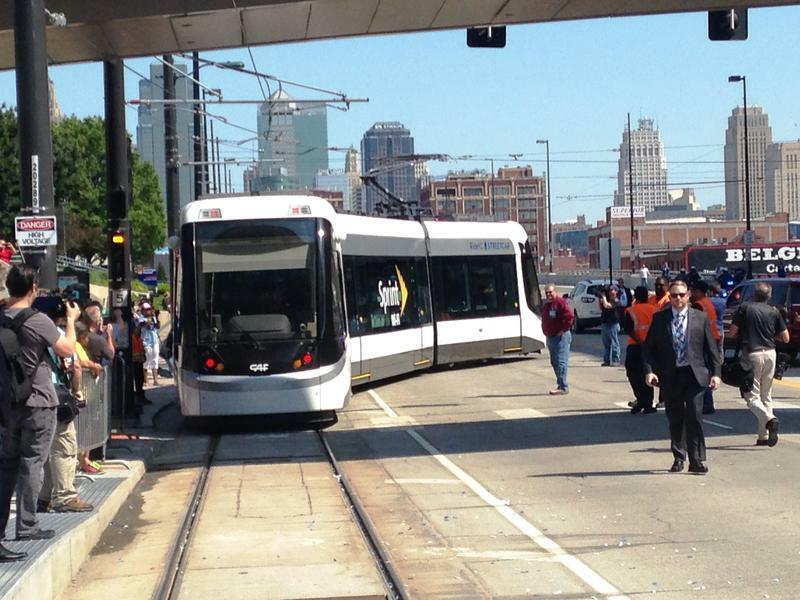 One, brought to the council by a citizen petition initiative led by transit activist Clay Chastain, proposes two sales taxes totaling 3/8 cents for 25 years to build the streetcar beyond just the southern UMKC expansion. The other, which was also brought by a petition initiative, would prohibit any streetcar expansion unless it's put to a city-wide vote. Lisa Rodriguez is a reporter and the afternoon newscaster for KCUR 89.3. Connect with her on Twitter @larodrig. Plans for a new downtown YMCA, the latest on expanding the Kansas City streetcar and an update on the UMKC downtown arts campus were discussed by the Downtown Council of Kansas City Thursday. Backers of a planned Downtown YMCA that would incorporate the facade of the historic Lyric Theater as part of the $30 million project hope to wrap up fundraising this summer. Virginia resident Clay Chastain has another yet another proposal for Kansas City voters – a $2 billion plan to build light rail from the airport to the Cerner campus in south Kansas City.